L'automne s'installe tranquillement, avec lui, nous arrivera l'Halloween. J'aime bien cette fête, avec ses sorcières et ses fantômes, les citrouilles allumées et les petits qui se promènent. Lorsque mes deux garçons étaient enfants, je me déguisais en sorcière et je sortais dehors donner des bonbons aux jeunes qui envahissaient la rue. J'aime beaucoup Tilda assise avec ses citrouilles. Elle a l'air d'une sorcière bien sympathique, comme je les aime! Il y a longtemps qu'elle fait partie de ma collection,mais je n'avais pas encore eu la chance de la colorier. Cette semaine, à Stamptacular SundayChallenge, nous vous proposons de vous amuser avec un sketch. 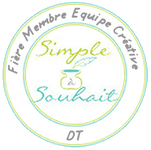 Bien que je ne participe pas j'ai relevé le défi, et je vous invite à vous laisser inspirer! Tonight as I write this post, my window is a little bit open, the air is fresh; fall is here. Every where in the stores, Halloween articles are offered. I like this day, because I like witches. Nice witches however! Like Harry Potter, little Hermione, one exception made: Professor Rogue... He was one of my favorite character in this story! When my kids were young, I used to disguise myself in a witch. I had a big hat, from witch hanged spiders! I painted my fingernails in black, and gave candies to the children on the street! I enjoyed this so much. This is what Witch Tilda reminds me. I've had her for quite a while, and did not have a chance to ink her! This week at Stamptacular Sunday Challenge, we are asking you to create a project using a sketch, eventhough I will not participate, I decided to play with the sketch. I modified it a bit to suit my needs, and created a spooky night for Tilda. No wonder she holds her hat! Thank you for visiting, and hope you will be inspired ! Les citrouilles, les fantômes et la chauve souris sont de mon inventaire. L,étampe est de source inconnue. She was colored with Copic, and atyou spica gel. The sentiment stamp - unkown source. Very cute. I like how you cut out part of the tree over her head. Your coloring is just lovely! Dan!!! Your card is adorable!!! I love the image and your coloring is amazing, as always!!! :)) It´s a pity we don´t have any halloween celebration here. I´m sure the kids and adults will love. I would!!! :))) So... I can just see your creations and enjoy them!!! Oh this is so cute Danielle, but how can anyone call this little cutie spooky? I love her. The little ghosts are a great touch! So spooky!! I love the purple and black and your embellishments are great. Awesome card! J'aime beaucoup la mise en scène et la coloration très bien réussie comme toujours! This is so cute, I love your coloring of Tilda and the little accents you added are perfect! Dan, your coloring of this cute witch is magnificent. Love the little scene you created. Quelle mise en scène, Danielle! C'est absolument magnifique! J'adore tes embellissements - parfait pour Halloween! 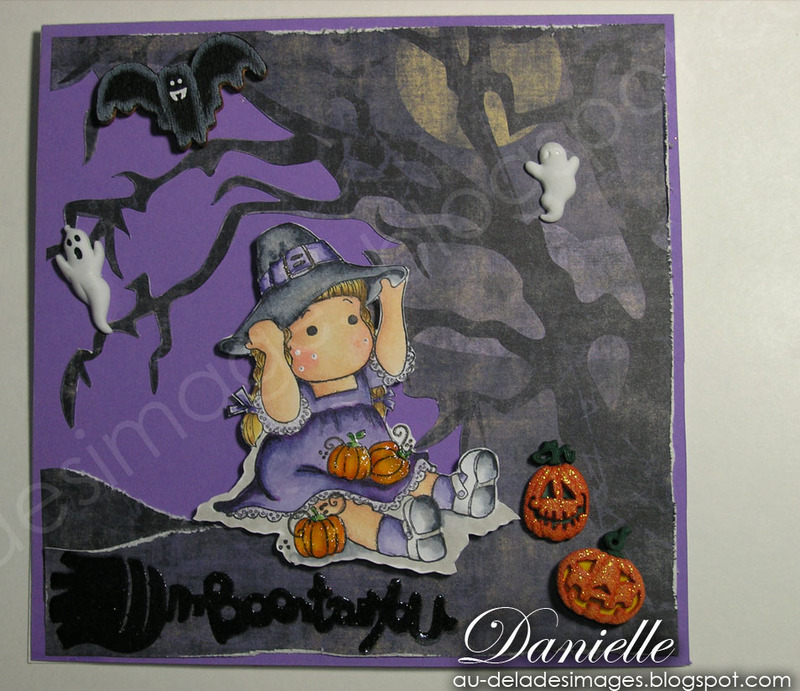 Adorably spooky card, Danielle! I love the ghosts and pmmpkins and Tilda is just too cute to spook! I really love how you did the background with the tree. Looks awesome! She's adorable Danielle!!! I love the glaze you put on the pumpkins and Tilda looks spooky =) Congrats on getting the top 5 at MDUC!!! TRès belle carte! J'aime beaucoup Tilda en sorcière! Elle est vraiment mignonne et quelle mise ne scène! Bravo! Cute pumpkin embellishments. Love the glaze on the pumpkins around Tilda. beautiful coloring Danielle! she's adorable in purple! Tu as très bien capté l'expression de Tilda. Superbe carte. J'ai un faible pour Haloween. AH!AH! «en attente de d'une nouvelle merveille. oooooo, spooky looking papers! You did such a great job on your Halloween card! très jolie carte avec tout plein de détails! Wow, this card is fabulous. Such a fantastic reminder that Halloween is just around the corner. 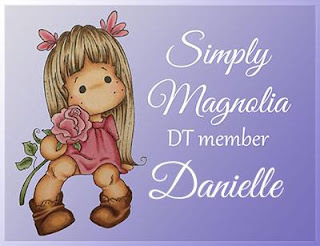 Danielle, please keep your creations coming! Awww this is so cute! Great little scene! 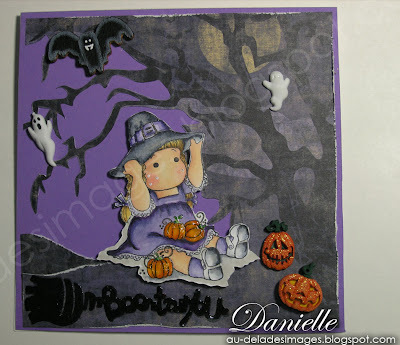 Love how you did the background for this cutie Tilda witch!!! Just adorable Danielle! I love the color purple you chose to use for Tilda's dress. very pretty! even for a little witch. LOL.